We've been testing various X-Micro products for over two years already. I usually wrote articles about them with pleasure — it's nice to review good products, designers working for this manufacturer always managed to create good devices. Even when it's impossible to add anything special, the company at least offered high-quality and convenient devices. If designers could apply their creativity, results could surpass all expectations. But as the proverb runs: "nobody's perfect". X-Micro has met its match - a simple flash player. To be more exact, not quite simple — on the face of it, it's quite a modern device supporting video playback, with a color display, etc. There are lots of such players these days thanks to availability of proper controllers and other components. So I didn't expect a dirty trick from a device, designed in late 2005 — I though it would be a usual model, for example based on one of the latest Telechips controllers (fortunately, they support video playback by default). However, our hero of the review differed from the other players we tested in its power supply — we have never seen such batteries before. That's why we decided to test this player and it immediately started demonstrating its peculiarities. Each of its drawbacks is tolerable in itself, but together they turned into rare devil's brew. So, I cannot say I enjoyed working with this player. But I had to complete the review firstly because it's my job, secondly because I had to shatter the positive impression, which could be produced by our latest articles from this section. Not all players are identically good, the same components can be used in a very good model as well as in a bad one. Consumer's choice is by no means limited to good and excellent products. The player is large. In fact, it's not horribly large, it's just big. Considering the AA battery, it's clear that this player cannot be a miracle of compact size objectively. But other manufacturers that still use such power source (not many of them are left, because these elements are too bulky) manage to make their players smaller. Physically as well as visually. In this very case, designers were too clever by half. However, this player would have looked good but standard, if it had been a tad thinner (you can see on the photo below that thinner design would have been definitely better). We see such designs on a regular basis — a horizontally elongated bar with a display and a joystick on the front panel, three buttons on top, Hold on bottom. But the device is too thick - it spoils everything. A thorough examination of the player reveals more problems. For example, this model does not have Line-In, but it has an empty seat for it — symmetric to Headphones-Out. USB is covered with a round cap, the same cap is symmetrically located on the opposite side. Well, we can understand the desire to make this device symmetric. But why the asymmetric position of the display? The insert does not ruin symmetry — top and bottom gaps to the front panel are the same, so when the display is backlit everything is great. But the display itself is smaller and is decorated with mirror borders. From three sides! A strange approach, to put it mildly. We can assume that the player was initially designed for a larger display (128x96 with the same pixel size as in the current 96x64 display), but due to price reductions it was equipped with a smaller one. Why not make the border symmetric then? Well, our gripes with the symmetry can be considered far-fetched. But still — the player actually lost the first round in the fight for consumers' sympathy. Because of its bulky size. It's larger than other players powered by an AA battery, even considering that such models are always large and heavy. I don't know why use this battery type. There was no other choice five years ago — even this power source could not always provide run-down time for at least seven-eight hours. But today miniature models work fine with built-in batteries. If you don't like such solutions, you may buy a player that works with AAA batteries and enjoy music for up to 20 hours. What's the point in AA batteries then? But the worst is still to come. It's time we speak about the first hit below the pager. No, nothing of the kind you might already imagine — the player supports UMS mode and requires no drivers. Only for flashing, but that's minimal evil (still, many manufacturers have already learned to flash firmware using only player's resources — you just have to upload the necessary file to memory, so the lack of this feature here is a drawback). But I wouldn't be disappointed even if I had to use a special manager. As I have already mentioned, the only requirement here is a convenient utility. If I use a player for playing musical files, I have no gripes with this method. In this case the problem is less pleasant — USB 2.0 Full Speed. The transfer rate is very good for this mode (up to 900 KB/s for writing data), but only for this mode. Take into account that the model has a modern memory capacity — up to one gigabyte (fortunately, the 2 GB model is not yet available). Plus, the video playback feature, so you may have to upload large files (at least theoretically), which will take several minutes to transfer. That's not a fatal drawback, but it's still very unpleasant. Unfortunately, that's not the only problem — or we would have dismissed it. OK, everything is clear with uploading files. Now let's see what files we can upload to memory of this device. 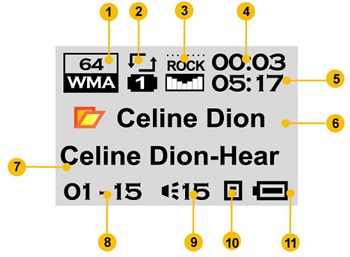 It's all great with musical files — the player fully supports MP3 and WMA. Many models can boast of OGG support, but that's not a standard feature yet (who knows, may be it will never be), so let's not grumble about that. But on the other hand, the situation with encoding parameters for both formats are excellent — the player officially supports 8-320 Kbit/s for the first format and 5-384 Kbit/s for the second format, which corresponds to the facts. Besides, there are no problems with sampling rates. If only other features were that good! As I have already mentioned, the player supports video playback. But only in a proprietary format, into which you should transcode your video files. I don't know to what group of formats it belongs, but its container is evidently non-standard — I have never come across *.mtv files. It's hardly similar to MPEG4, just look at file sizes. For example, I have a low-bitrate WMV 320x240 video (55 MB). Having converted it with the bundled utility, this file has grown to 400 MB! Despite a much smaller frame size and a limited frame rate. However, the results are not always that disastrous — a 275 MB video file (DivX, 720x528) has been converted into a 320 MB file, that is it has put up less weight. But the fact remains — this video format is very specific; moreover, it offers worse compression than typical MPEG4 modifications. Resolutions are lower, while file sizes are larger! That is we cannot speak of using it in a portable device. However, you will hardly notice this drawback in practice: compact players need video support only for a line in specifications, as watching video on the 1-inch 96x64 display makes no sense. So in practice, it makes no difference how many files you can upload to memory. One of the latest firmware versions allows to display texts for reading. In fact, there is nothing new about this feature for X-Micro players. But MusePod, for example, couldn't be used for reading Russian texts, because it was not localized. Video MP3 400 supports Cyrillic, its popular ANSI encoding (Win 1251), so it can be used for reading text files. On the other hand, the display is too small, it will do only for reading short notes (ergonomic color profile — green text on the black background). Unfortunately, some portions of text are not displayed for an unknown reason. I have an impression that text is output to a virtual 96x96 display and a user cannot read text that is shown in bottom part (1/3) of the screen. If it's true, this error may be fixed (text support was not added from the very beginning, so it may be improved in later firmware versions). However, this small display does not encourage reading large volumes. No bookmarking disinclines reading books with this player. And the last option – images. This feature is quite natural — if this player supports video, it's very easy to support graphics. The player supports not only JPEG, but also GIF. The clever player detects how to display an image on its own: landscape images are displayed as is, portrait images are rotated 90°C. But this player lacks manual scale control. That is a large image will be resized to fit the screen, but you cannot zoom it to have a closer look at some fragment. Considering this limitation, this feature is hardly useful. Now what concerns non-musical information in audio files, or tags. Positive issues: both ID3 and WMA tags are supported, full localized firmware supports Cyrillic in all tags. Unfortunately, the latest extensions (lyrics or images in tags) are not supported — the player displays only a song title, author, and album (not all players can do the latter). And field lengths are not limited (in case of ID3 v. 2.x, which is preferable for this player). Unicode is not supported in ID3 tags, which is also the case in the majority of modern players. Another drawback - all the three fields are displayed in a single creeping line, which is not convenient (considering the display size) — you have to wait to see the album, but that's a usual price for a compact size. Control scheme with three buttons, a lock button, and a joystick has become a standard for the majority of players, so it's rather easy to master X-Micro even without User Manual. If you have ever dealt with a similar model, all the others will be the same. If you have never manipulated a player, controls are pretty much intuitive (especially considering the localized menu). We noticed no control peculiarities in playback mode. The radio mode will be discussed below. There are some drawbacks here. One little problem — there is no playback control for video files. But I have already told you that you will hardly want to watch movies on such a display, so the majority of users will not notice this drawback at all. The other problem is evident — no directory navigation. Not just that — there is no support for a hierarchical file system either. You don't have to upload all files into the root directory — one nesting level is available (that is there may be directories in the root folder, but you cannot create subfolders there). The player goes to the next directory as soon as it played all the files in the current directory. You can also stop playback and choose a directory. Does it ring any bells? Yep — the standard rudimentary navigation for Creative MuVo players. But in their case, this navigation appeared long ago, in times of 128MB or 256MB models. This series was no conjurer even at those times — just cheap and compact players, users complained about such a navigation a year and a half ago. As for now, it's a nonsense to launch a player with cool characteristics (video support, up to one gigabyte of memory, etc), but without subfolders and good navigation. What did engineers think about, I don't know. There is nothing much to comment — everything is bad. It's not that bad compared to no-name CD players, which can still be found in retail or compact cassette models, which cannot output high-quality sounds by default. 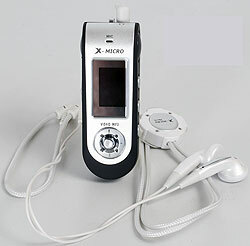 But our model under review does not stand a chance against modern MP3 players. As I have already mentioned, not only in testlab conditions — you can hear all the problems even in inexpensive headphones. However, multiple users of standard headphones have nothing to fear — all the differences between various players are immediately leveled down by their headphones. But we are none the better for it. Like the majority of modern players, this model can be used in voice recording mode. It does not have an MP3 codec, but it may be for the better: the two formats supported are more economical and fully sufficient for voice recording. It's very easy to choose between them: choose "Good REC" in the menu to get WAV ADPCM (32 Kbit/s bitrate: you can calculate the sampling rate on your own: if you are not into mental arithmetic, the answer is 8 kHz :)), choose "Long REC" to get a tad lower quality and use a special voice recording format ACT (8 Kbit/s). In both cases you can use the VOR function, that is you can actually pause recording. On the whole, the quality is mostly determined by properties of the built-in microphone. They are average — not bad, not good. I wouldn't record sounds from ten meters, but recordings from a couple of meters are quite distinct. Even in ACT format, which allows to record voice for several dozen hours even with a junior model (that's where you'll need a detachable power supply unit). In fact, the series includes six models instead of three models with different memory capacities — half of them can pick up radio signals, the other half cannot. We have tested a senior modification in both senses of the word, so I had an opportunity to test FM tuner. No discoveries — neither pleasant nor unpleasant. 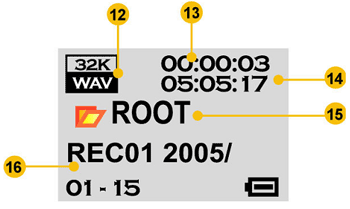 Average reception quality, the player remembers a list of 20 stations. Control is a tad inconvenient — for example, there is no special mode for seeking stations and writing them in the list: you'll have to do it manually. But the autosearch function is rather adequate — it detected only those stations, which reception quality was on a good level. In my usual conditions the player detected 13 stations — a good result. There were some interferences in manually added stations, so they were skipped for a reason. Another control inconvenience — you can move only upwards in the list of remembered stations (Play/Pause button), even though the majority of manufacturers solved this problem long ago - they introduced an additional mode, where the joystick was used to jump among the listed stations only. A convenient feature of this model - the player remembers the last mode before you turn it off, and turns on in this very mode. That is if you turned it off in radio mode, it will turn on in radio mode as well. Not all modern models can do that, though I cannot think of a reason why not. You can also record radio broadcasts. But as the player has no "serious" codecs, you will hardly use this feature — you will still get the voice recording quality, described in the previous chapter. The player uses the standard UMS driver to communicate with the driver. But you will have to preprocess video files before uploading them to memory. No wonder that everything necessary is included into the bundle. First of all, it's a video conversion utility. It's rather simple, but offers some specific features — for example, you can replace the original sound track for any other during conversion. Besides, you don't have to convert an entire movie/clip, you may cut the fragment you need. The other settings are rather simple: you may choose audio bitrate (96 or 128 Kbit/s), frame rate (up to 16 — too little, I should say, but that must be the cost for cheap componentry — competing models easily cope with 30 frames per second, while our model manages nearly twice as few with the same frame size), as well as color scheme (the display supports only HiColor, so this setting may come in handy). So, the program offers rudimental features for configuring and processing a resulting movie. But the program is still very simple. Besides, you will hardly use it very often for the reason I have mentioned several times already — such small displays are no good for watching movies. 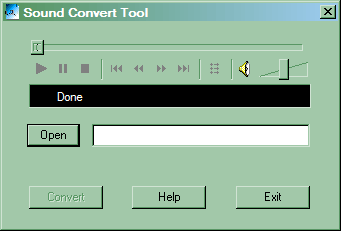 There is also a simple audio converter, which is necessary because of the specific voice recording formats — while many utilities can work with ADPCM, ACT files are not always supported. This utility can also play these files on a computer or convert them into more usual formats. The last utility is for flashing the device. The procedure is simple — you choose a special mode in the player menu, connect it to your computer, which will search and find (if you installed the necessary software) a special driver. Then you can use the utility to flash the device. 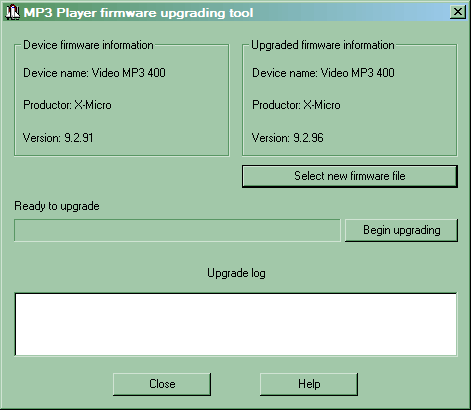 Not long ago it was almost the only method for players with UMS support (the others were usually flashed right from the manager, or the flasher was merged with the firmware version). But there has recently become popular a simpler method — you upload a file with firmware into the root folder, then you initiate the procedure by choosing a special option in the menu. This method is also more convenient, because we are not bound to any operating system. And you shouldn't install any special software on your computer. But this model cannot do that — X-Micro sticks to the old and less convenient flashing procedure. As I have already wrote above, there are officially three modifications of the player with different memory capacities. But the junior model couldn't be found in our parts when I wrote this article. Perhaps, it will not appear in Russia at all, as well as its modification without FM tuner.